I When I was a little kid, someone told me that Americans coat their fruit with wax, to make it look shinier. I thought it was B.S. It was quite a shock to see this label. Needless to say, I grabbed a bag of mandarines imported from Mexico. 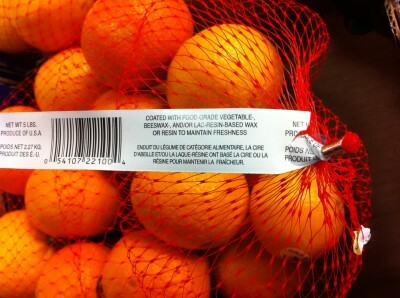 I guess that, at least with citrus fruits, you don’t eat the peel, but still… More label reading from now on.